Taiz is an urban city of 320,000 people. The buildings are not high, usually two floors, but they are densely packed around narrow streets that cover the fertile valley. Taiz was once the capital of Yemen. The metropolitan sprawl was best viewed from the top of Jabel Sabre. Most of the buildings in urban Taiz are made from concrete blocks and are very modern looking. 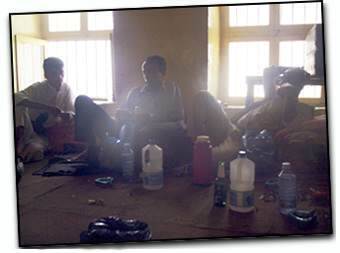 Taiz is still a large center for trade and commerce and so there are many hotels and accommodations for salesmen from neighboring Arab countries who have business in Yemen. It is also host to many European travelers and has just about anything that you could find in any large European city, if you know where to look. We decided to explore the urban Taiz from afar and headed for the highest location we could see. The steep road leading to the high vista was lined with little shops and fruit vendors. We stopped to buy fresh fruit on the side of the steep mountain road. "Ay ismuk?" I asked the peach vendor. "What is your name?" "Ismy Shefika," she smiled. Our interest and friendliness were immediately returned. We were invited to lunch with the peach vendor's family. Shefika lead us along a winding and rocky path to her family's home -- a beautiful yet modest house [left], perched on the edge of the Jabel Sabre vista, with a spectacular view of the entire Taiz valley [top]. While the rest of the Zone crew were treated to shai in the main living room, I was invited into the kitchen. I enjoyed some special moments, playing with infants and kittens while the women made bread, laughed, and cooked chicken and rice dishes from scratch. Entering the living room, I removed my shoes [see left] as is the custom. We were introduced to the whole family, including a bright, young girl named Yemen [left], who sang for us while lunch was served. The women of the house enjoyed the visit and were proud of their home. They made the crew comfortable by feeding them a delicious meal while I was treated to some Yemeni fashion advice and the opportunity to try on some typical apparel. Before I left, the girls applied red henna to my palms, staining them a deep red color. This type of henna is usually reserved for weddings and special occasions and I thought it was just the thing to remind me of the hospitality of strangers in this special land. We shared the entire day with a family that we had just met. This was an experience that was repeated many times in Yemen. The eagerness to show kindness towards others seemed to be easy for Yemeni people. They were almost always smiling and extremely polite. As the sun moved to the West, the room dimmed and we said ma'asalaam. The floor was littered with qat leaves, water bottles and shai glasses [below]. Indeed, we just had a festive party. The Yemeni have a great respect for their ancestors. In the small town of Jan't, just outside Taiz, we were shown The Tomb of the Unknown Sheik [above]. No one can remember who is in this tomb. There are no inscriptions on the exterior, and no one has ever gained entrance to the interior. Who would dare break the seal of a tomb? There are many such tombs in Yemen and they are always respected, no matter where they are located. Instead, the tomb has been, and always will be, maintained by a local mosque. 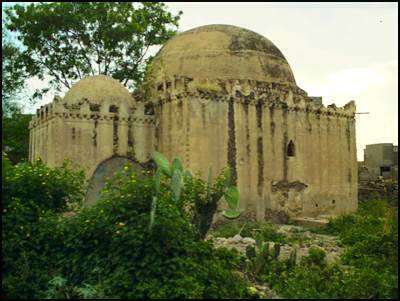 While the contemporary dead were buried within the walls of the mosque and cemeteries, the ancient burials were often freestanding structures. Before leaving the Taiz area, we decided to visit the large suq. Join us for this interesting look at Yemeni collectibles... and be prepared to be amazed!